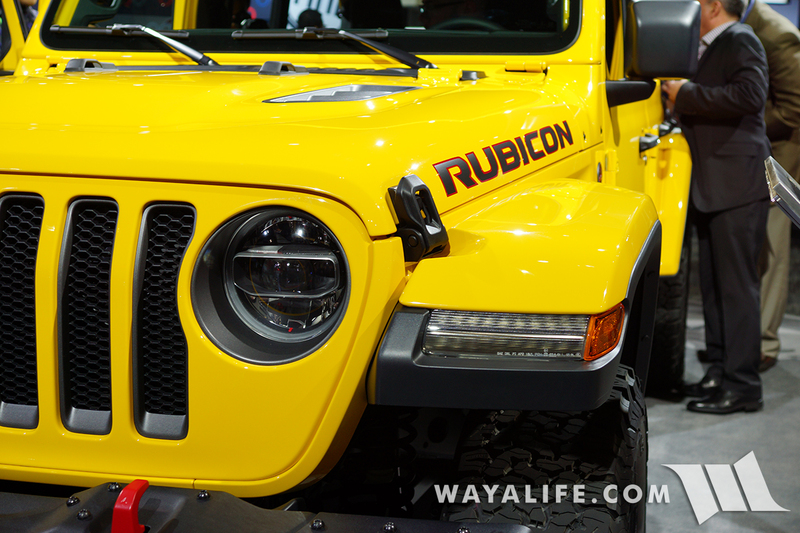 Of the 3 Jeep JL Wranglers that were presented at the official press reveal, this yellow Rubicon Unlimited was that really caught my eye. 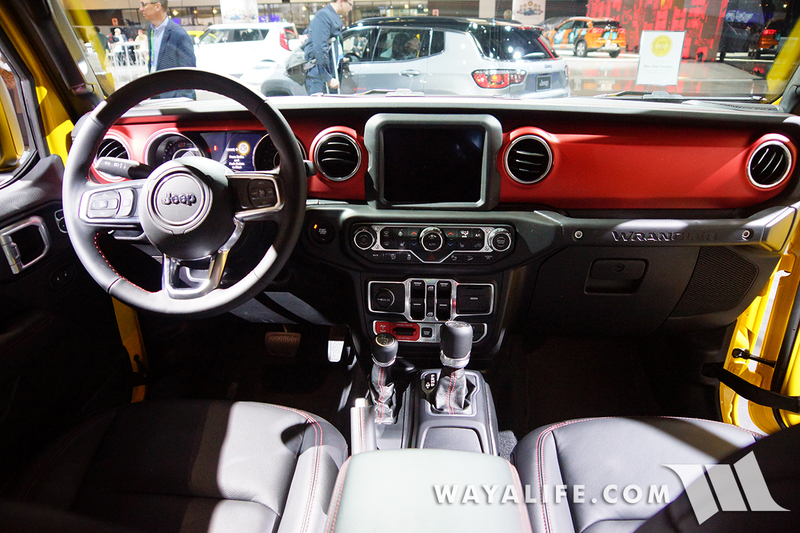 Not that the Sahara or red 2-door weren’t nice but this 4-door was the closest thing to what Cindy and I have already ordered and so I was eager to give it a closer look. 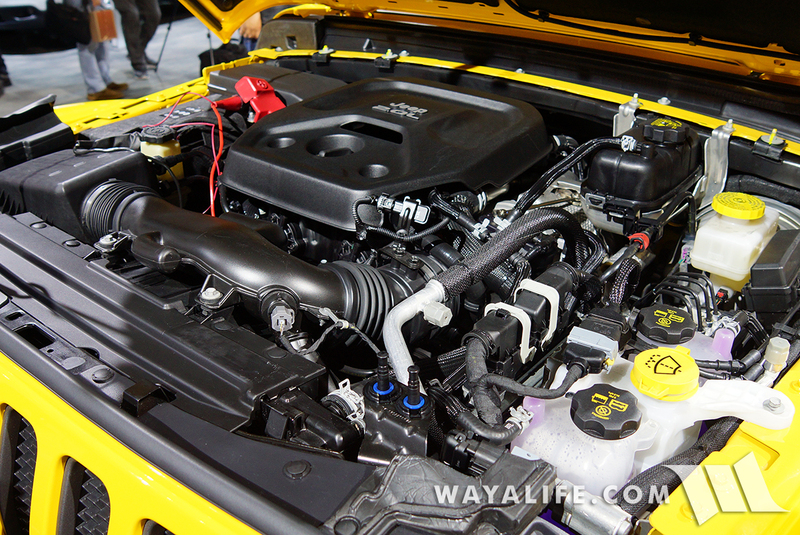 The only thing it has that we didn’t even have available to us yet is the all new Hurricane 2.0L Turbo I4 motor. 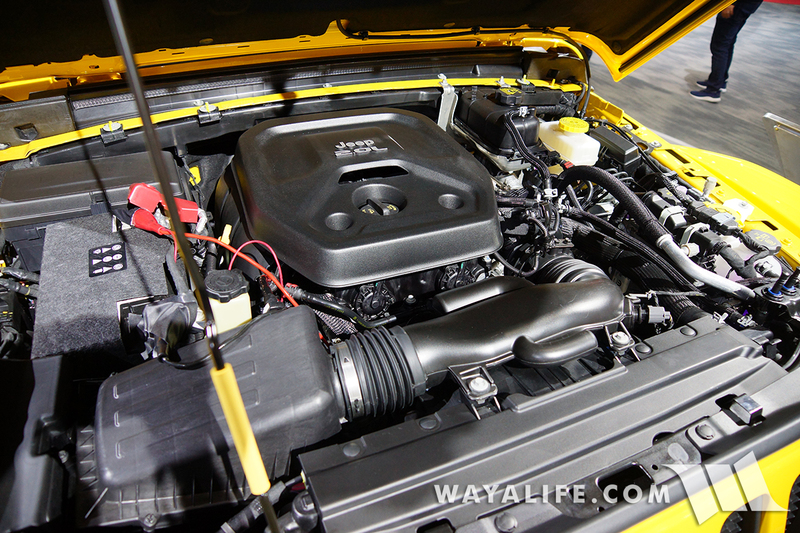 That being said, it was nice to see the soft top in safari mode and we got to see first hand just how easy it was to lower. 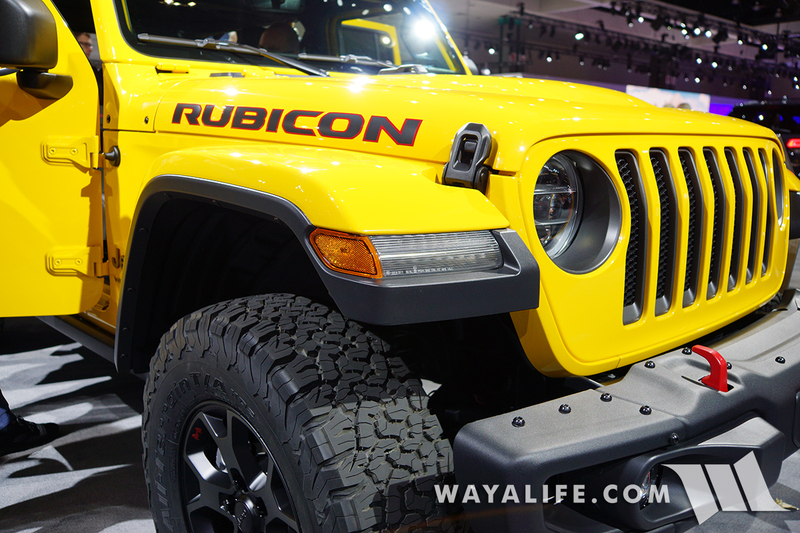 After seeing this, we can’t wait to get ours in our garage. 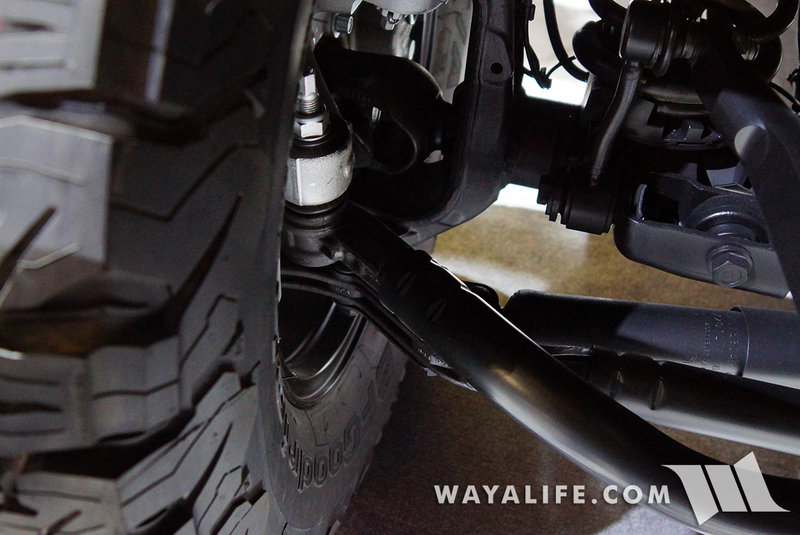 Here are a few detailed shots of what it looks like. 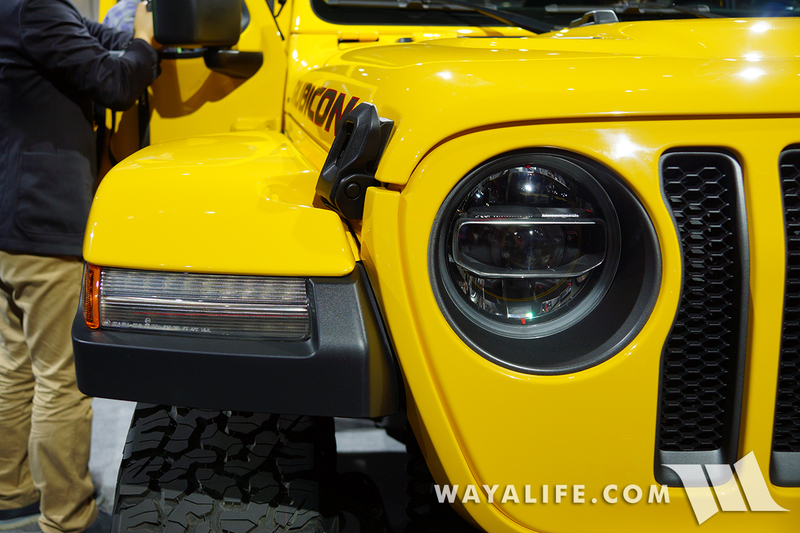 These shots give a better look at how the front fenders sit higher up much like the Mopar aftermarket JK Highline fenders. 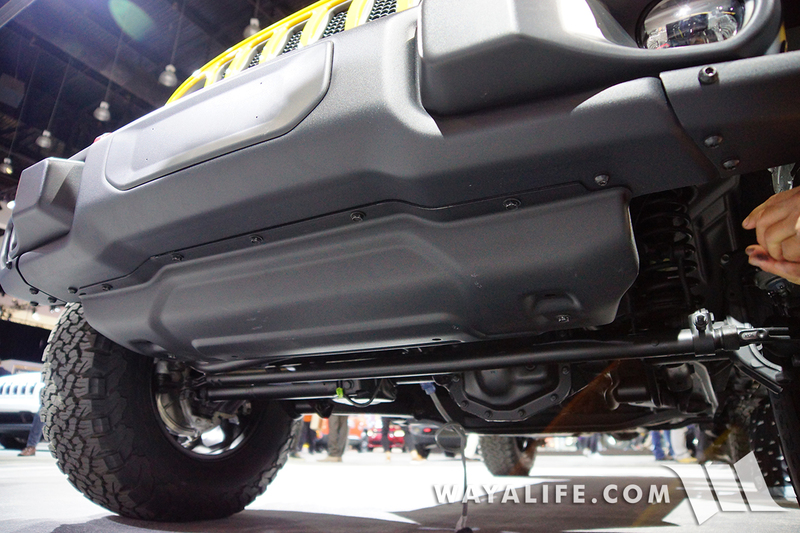 As has been the case for a while now on the JK, the air dam on this JL Wrangler is a steel skid plate. 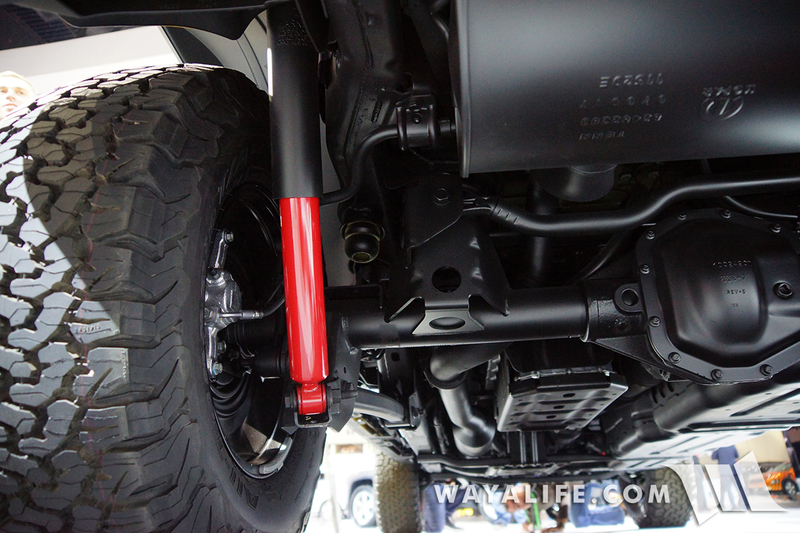 This shot give you a better look at the all new front Dana 44 Rubicon front axle. 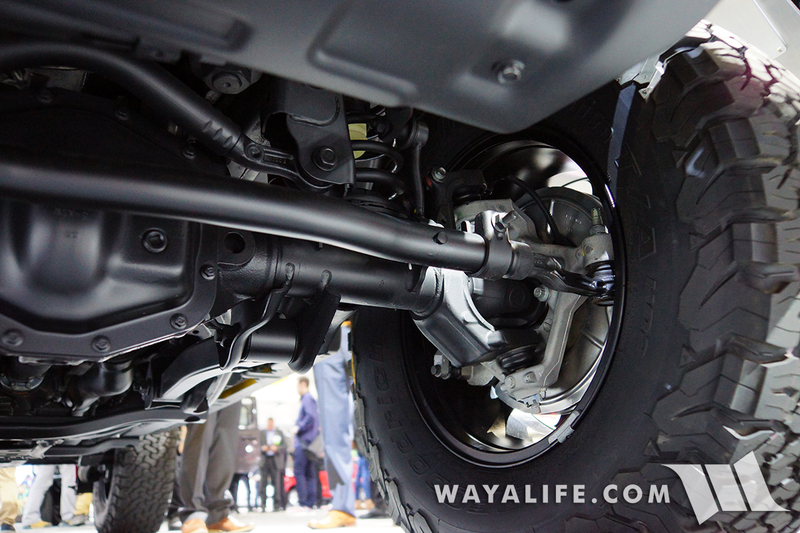 Here’s a couple of shots that give you a look at the beefed up axle C’s or end forgings as well as the all new aluminum knuckles. 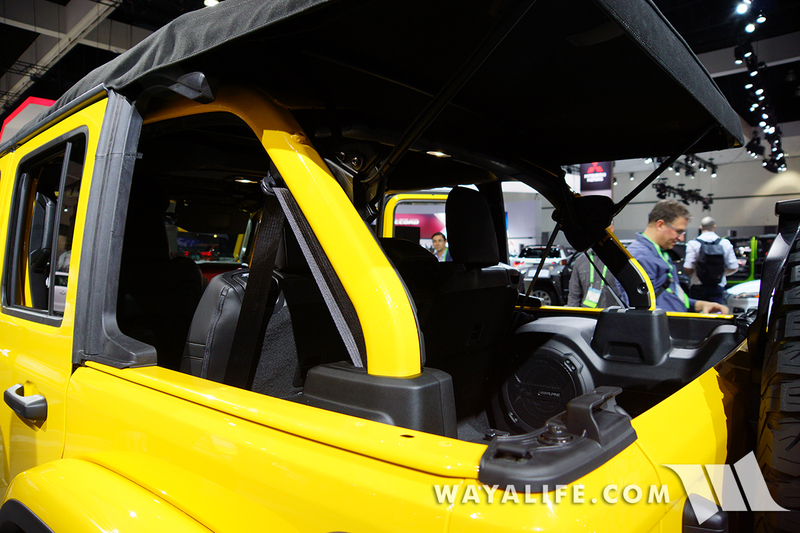 Here’s a look at the back of the JL Wrangler with the soft top in safari mode. 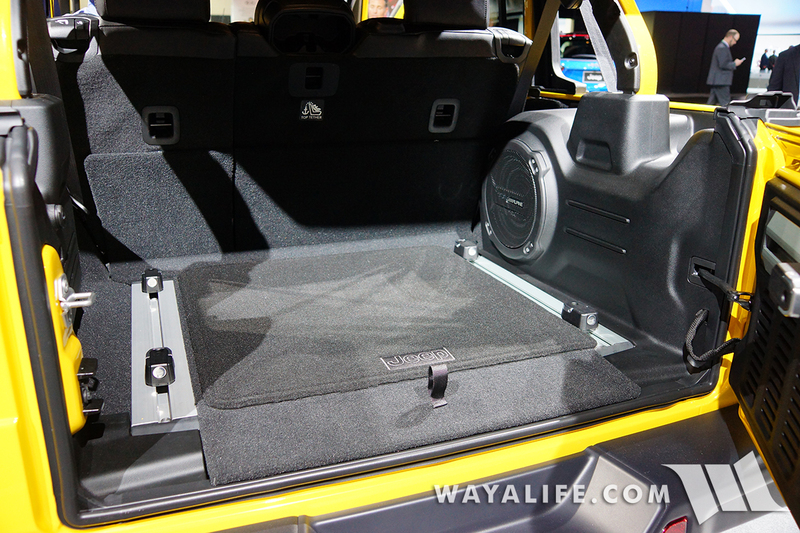 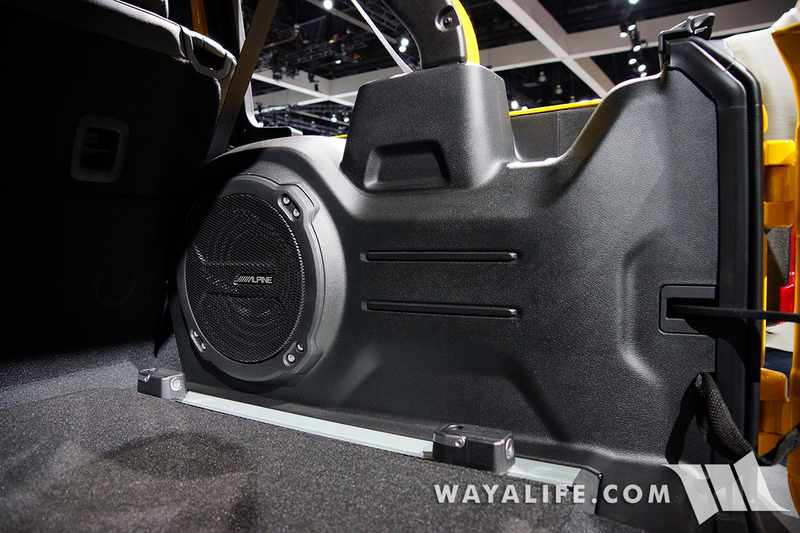 Still plenty of room back in the JL Wrangler rear cargo area even with the Alpine subwoofer in place. 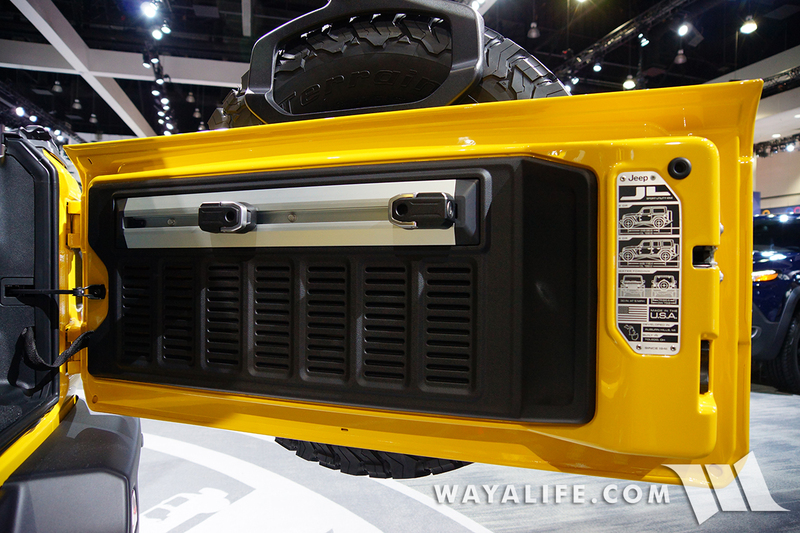 The JL Wrangler tailgate with cargo track installed. 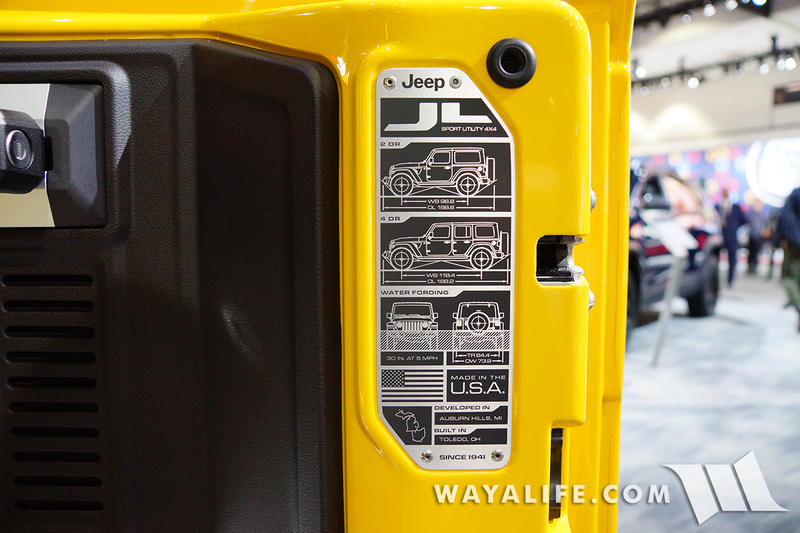 Nice to see an old school data plate on the JL Wrangler tailgate. 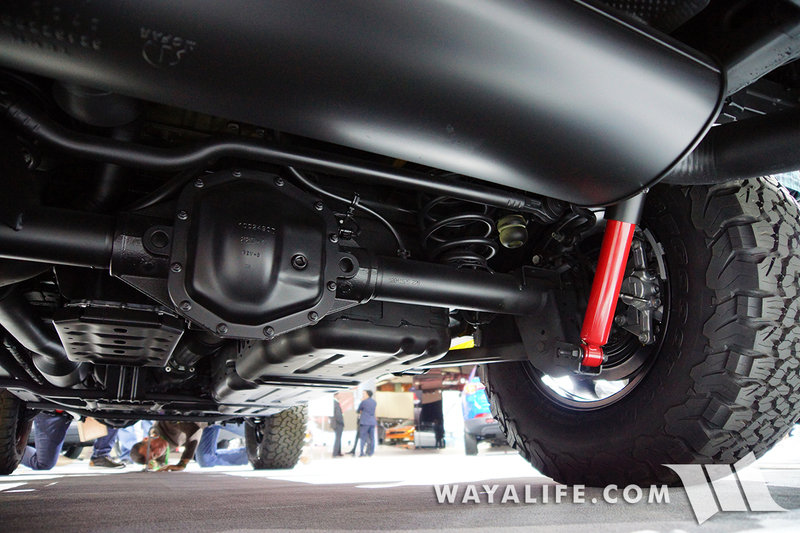 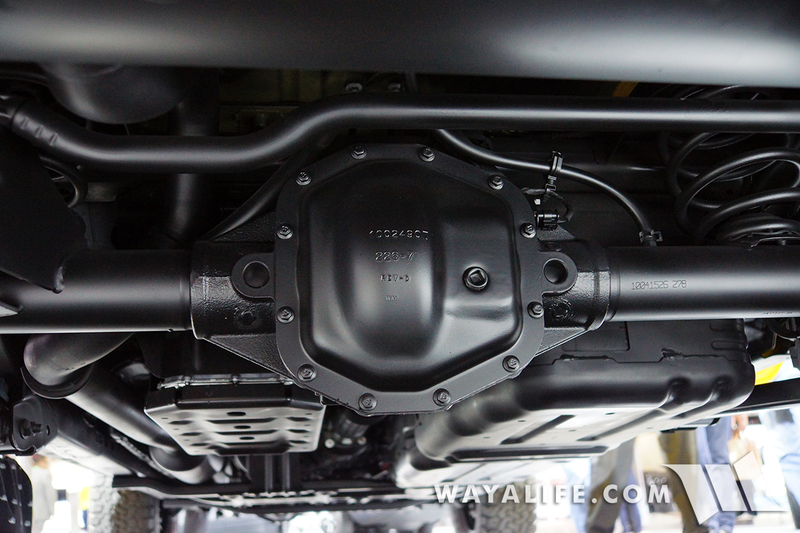 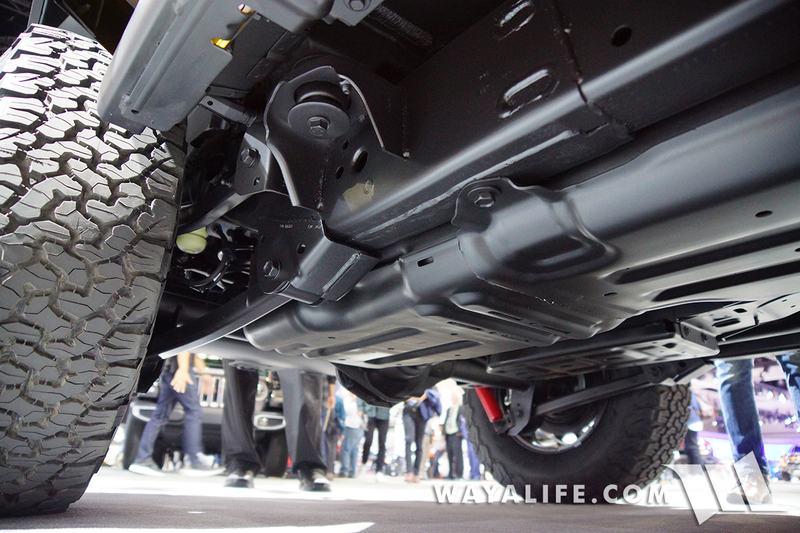 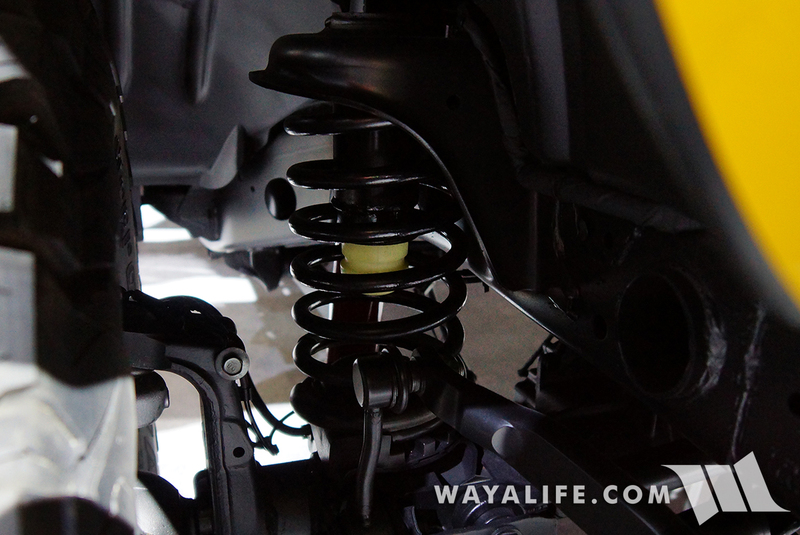 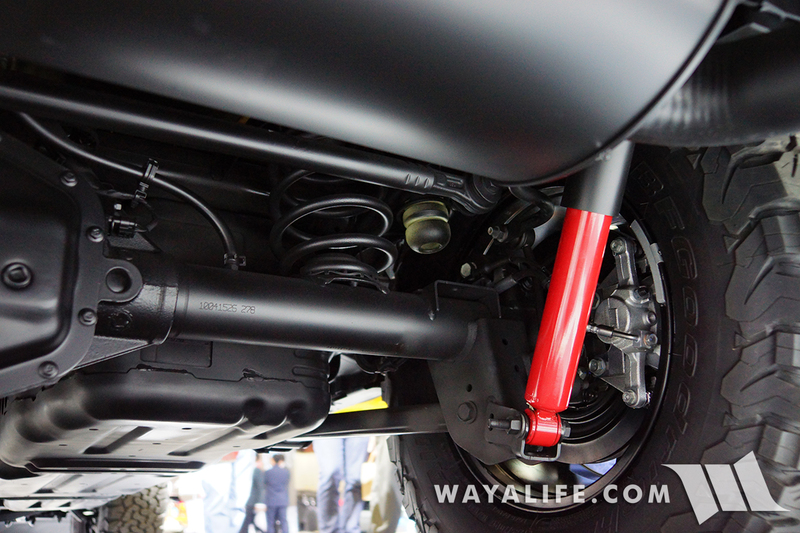 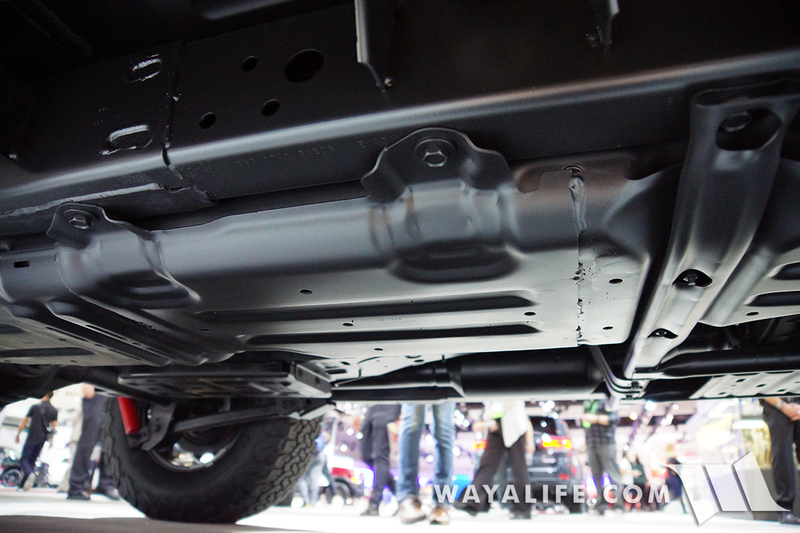 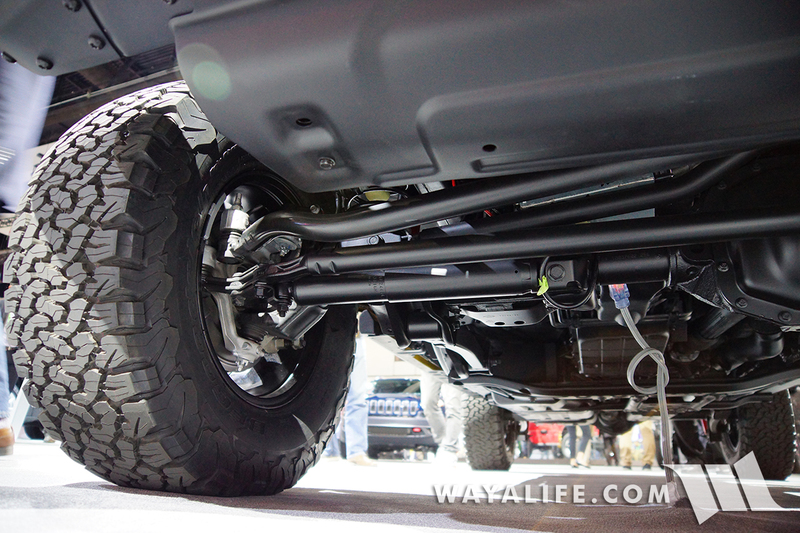 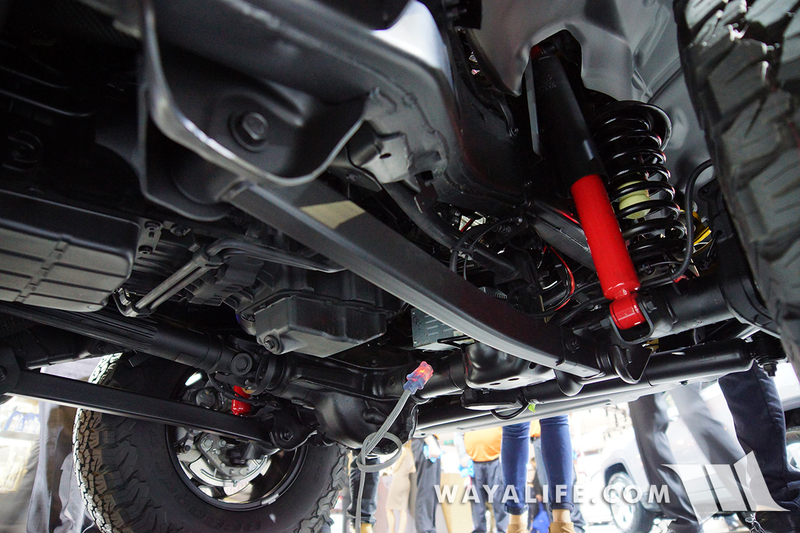 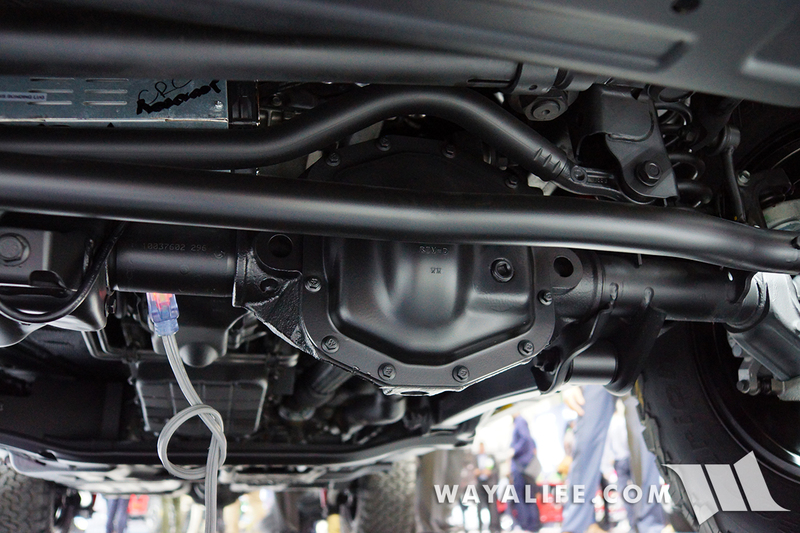 View under the rear end of the JL Wrangler to give you a better look at the rear axle. 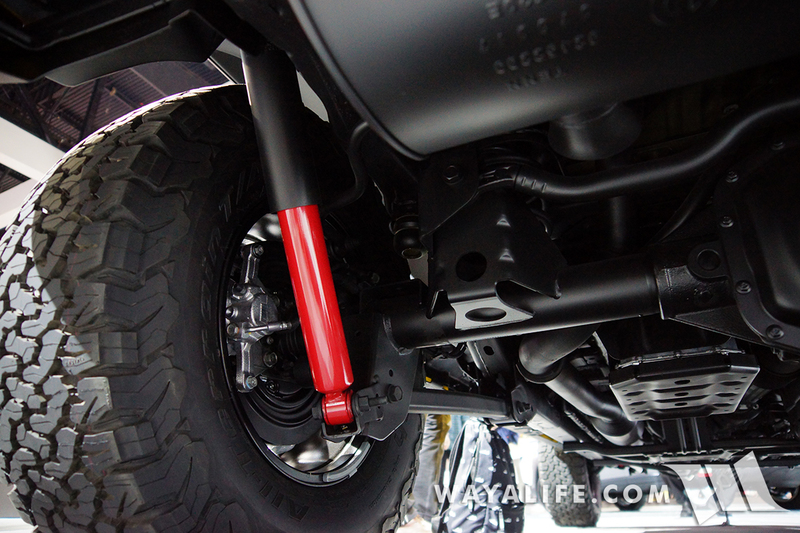 The rear shocks being mounted on the outside of the frame rails should give us some nice upgrade options in the future. 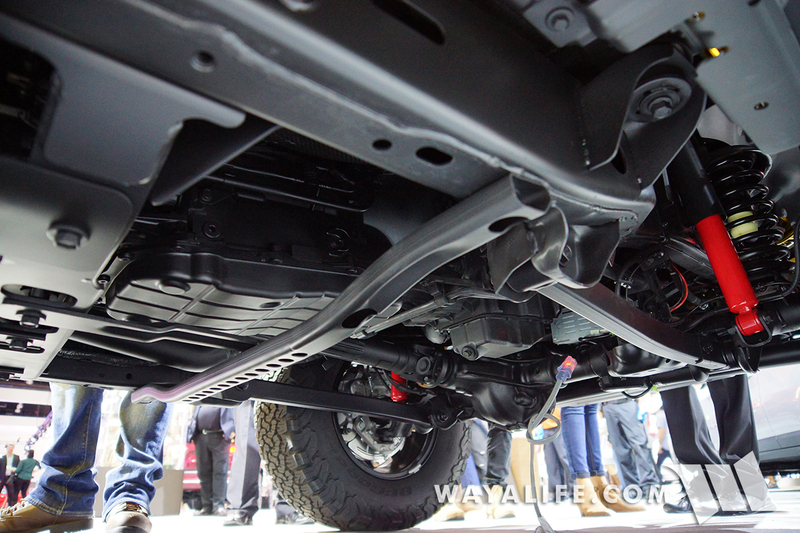 The JL Wrangler factory skid plates look beefed up to me and I have no doubt they’ll hold up just as well if not better than the ones we’ve been beating on Moby over the last 10+ years. 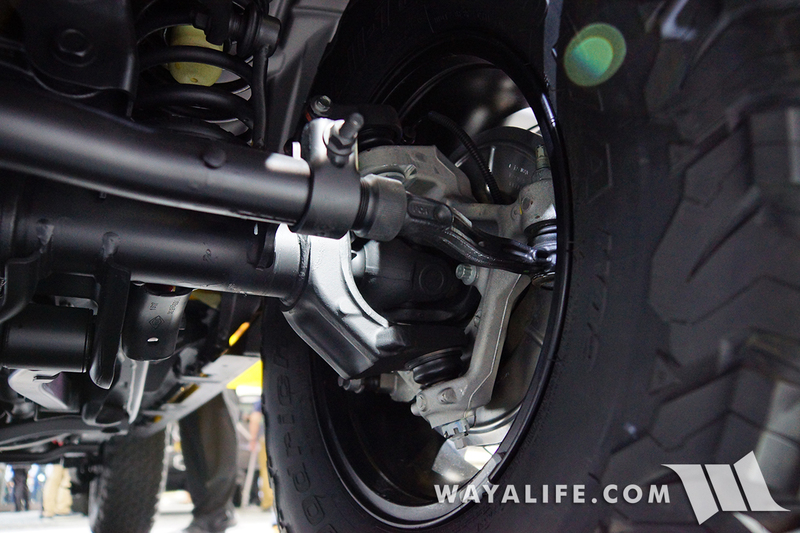 This is what the front axle looks like from behind. 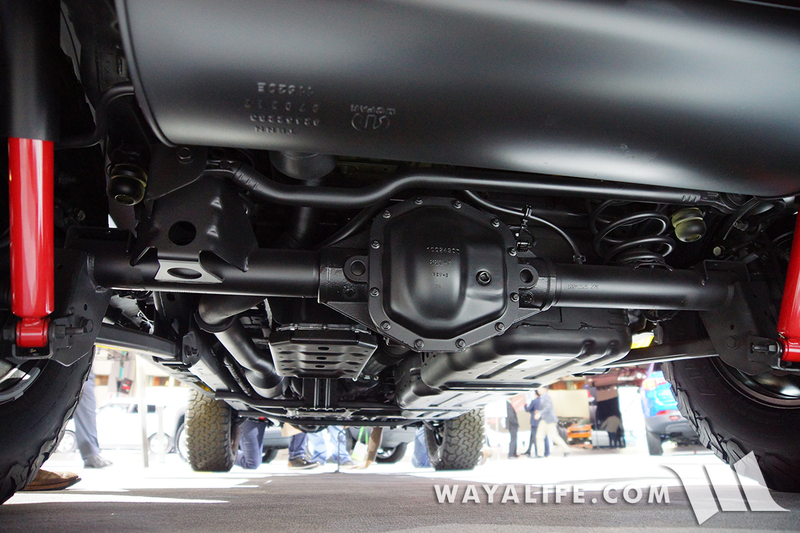 A look under the hood to see the Hurricane 2.0L Turbo motor. 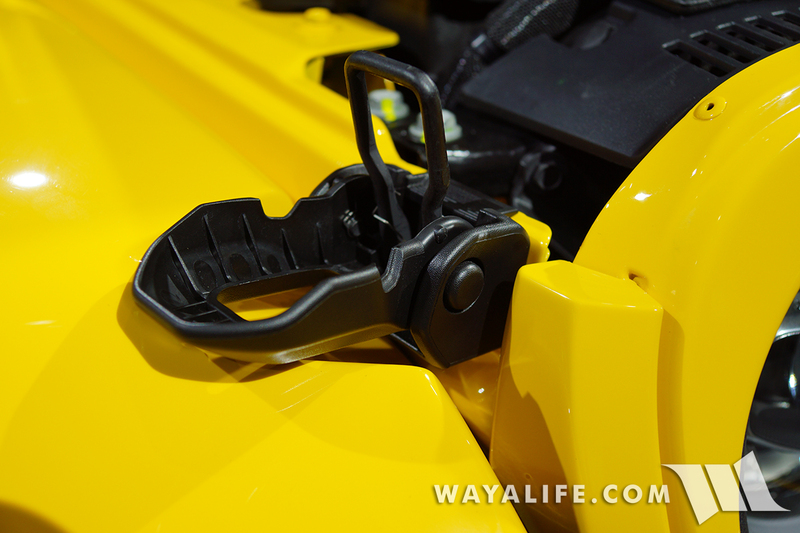 The new JL Wrangler hood latches are a nice improvement and look a LOT stronger than what the JK came with. 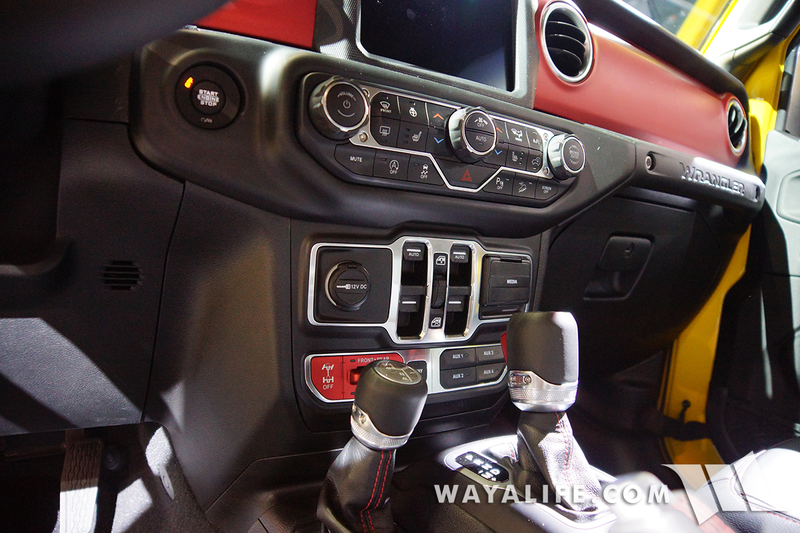 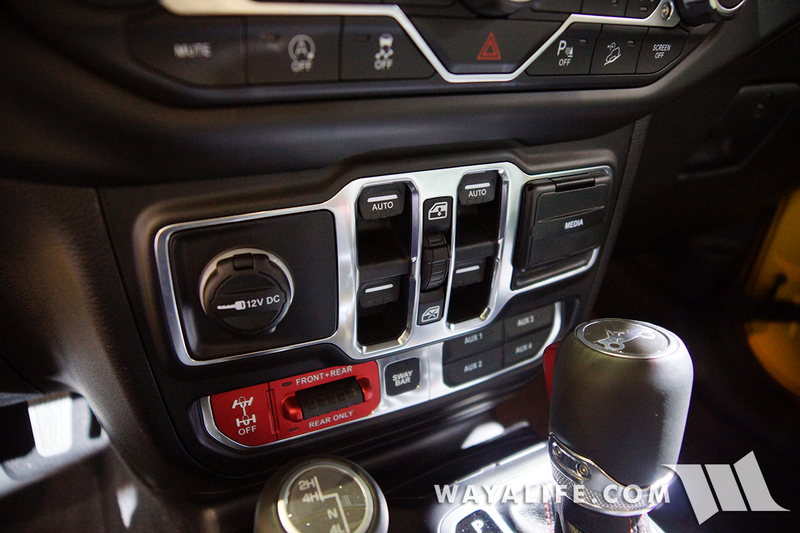 Here’s a few interior shots of JL Wrangler with red dash and highlight elements. 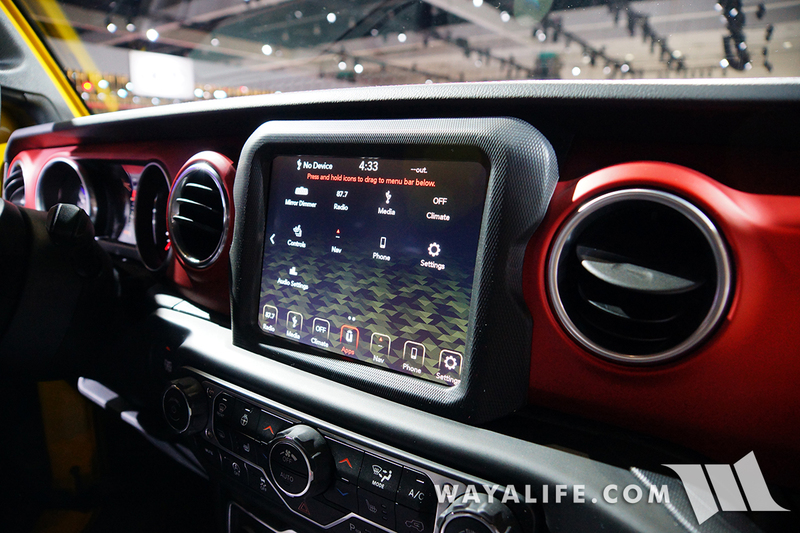 Can you say bigass infotainment! 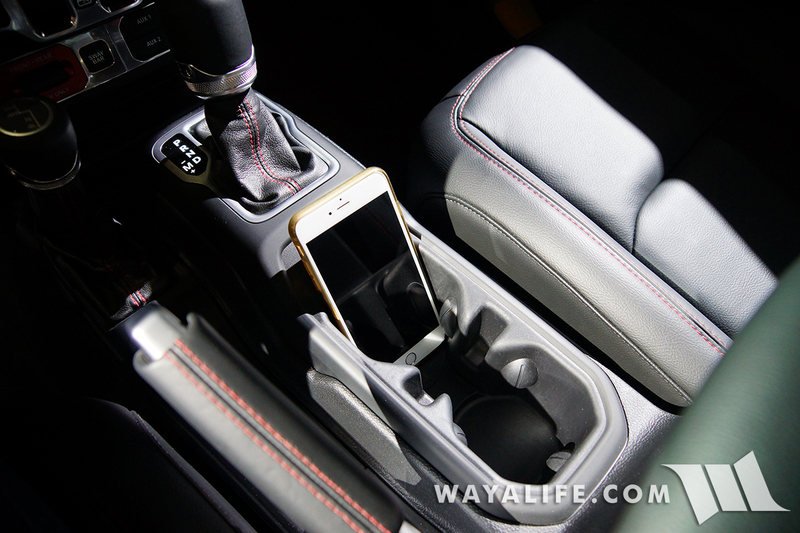 Nice to have cup holders big enough to accommodate an iPhone Plus! 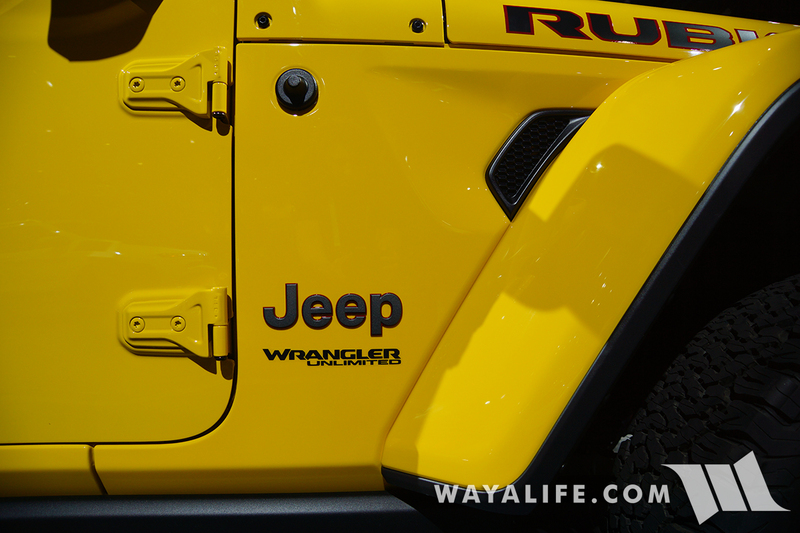 Built in garage door opener and more. 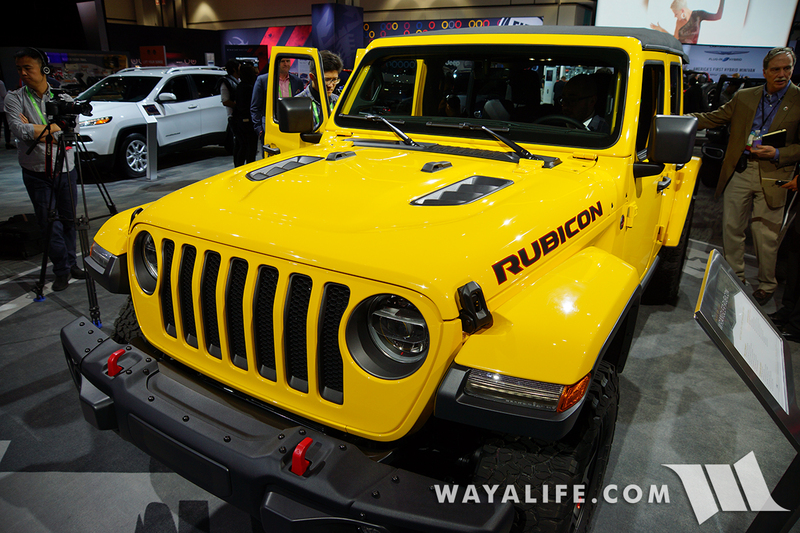 Rubicon JL Wrangler with MOLLE on the backs of the front seats. 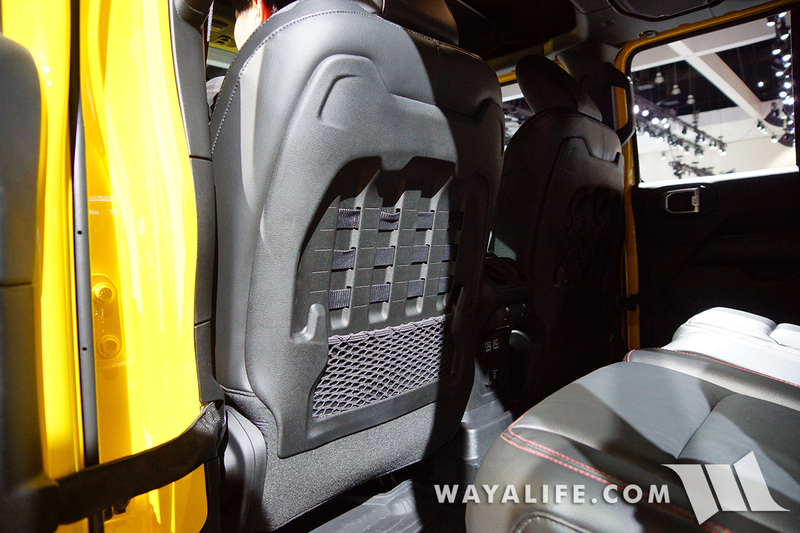 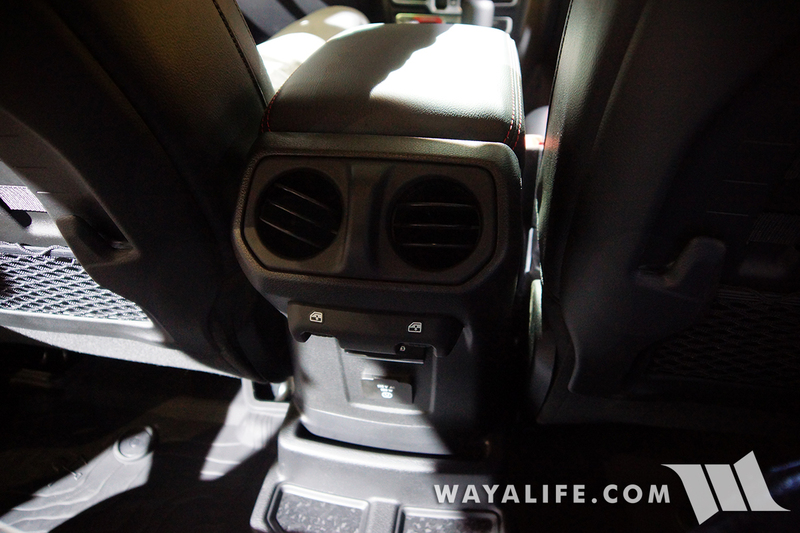 The rear vents on the center console is a MUCH welcomed addition on the JL Wrangler. 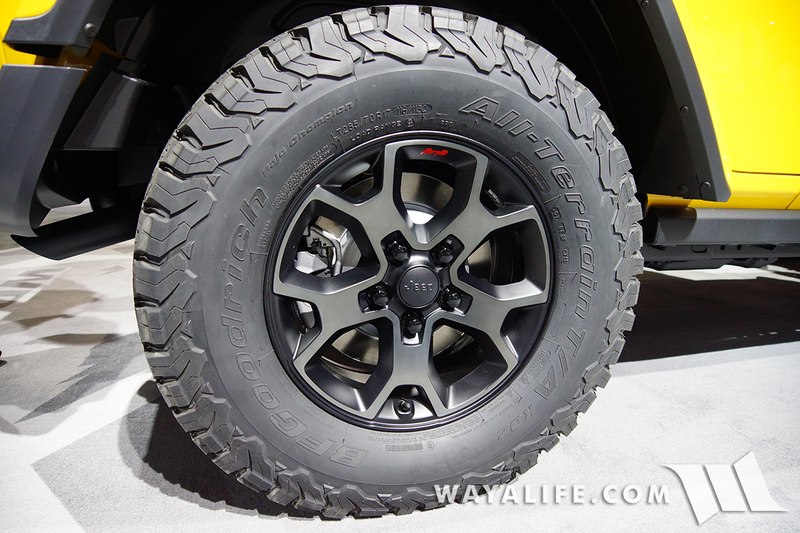 Last but not least, what the Rubicon wheels on this JL Wrangler look like. 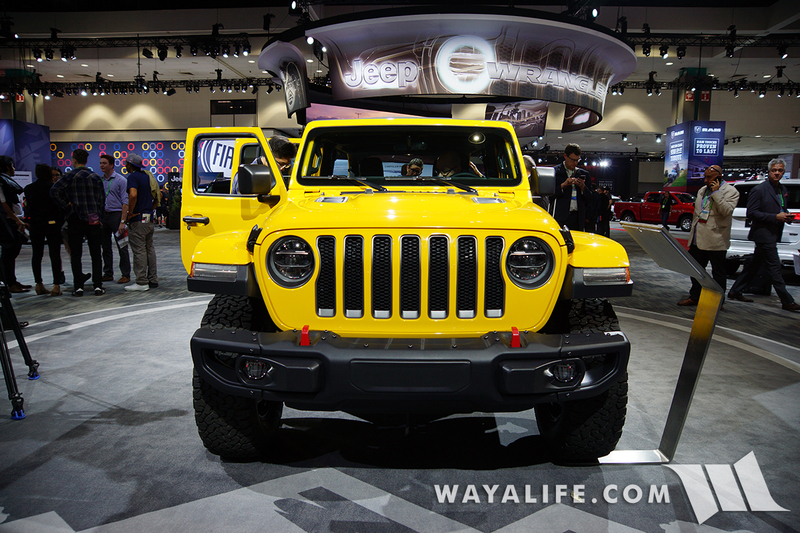 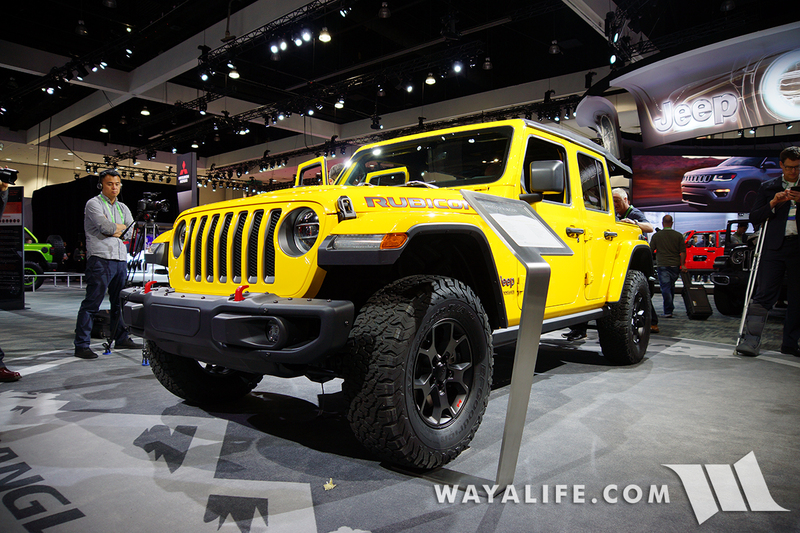 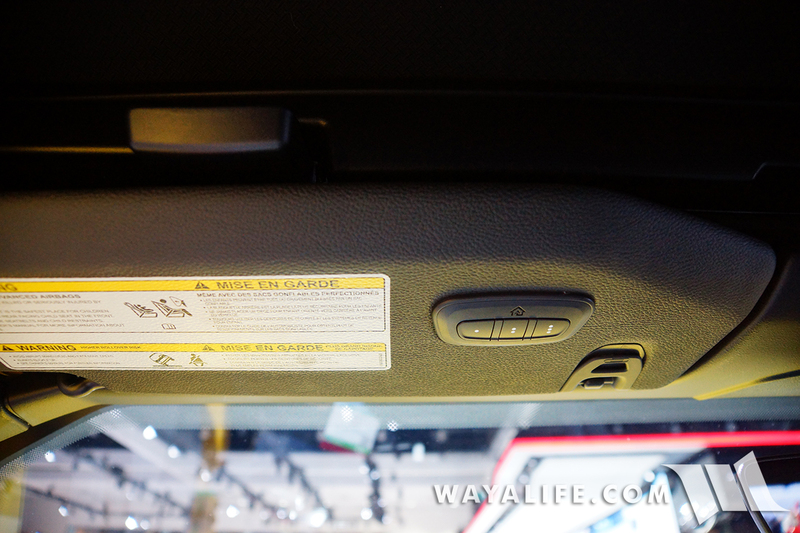 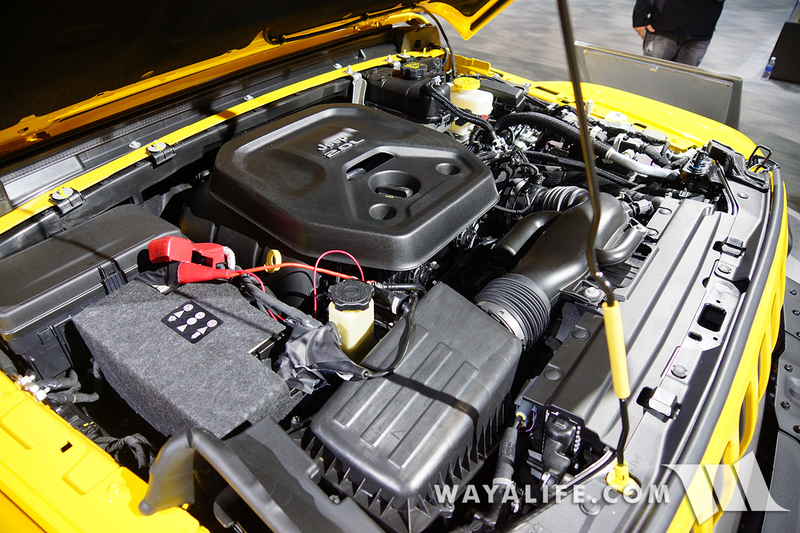 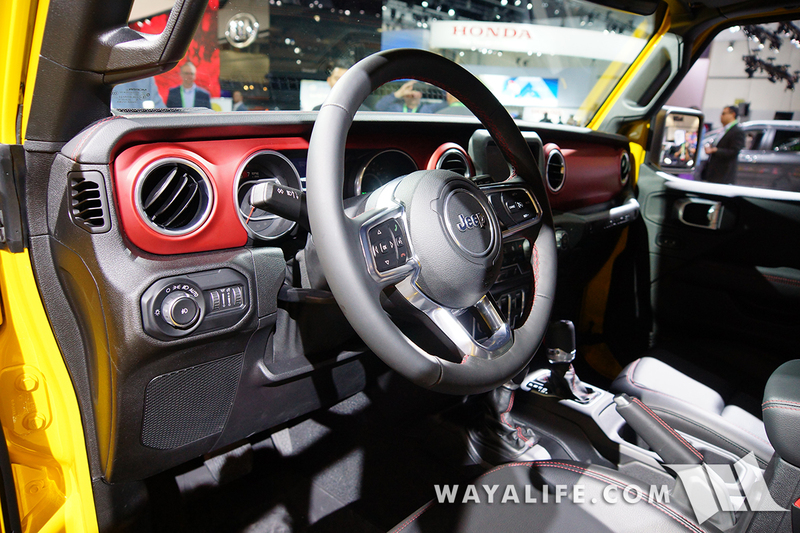 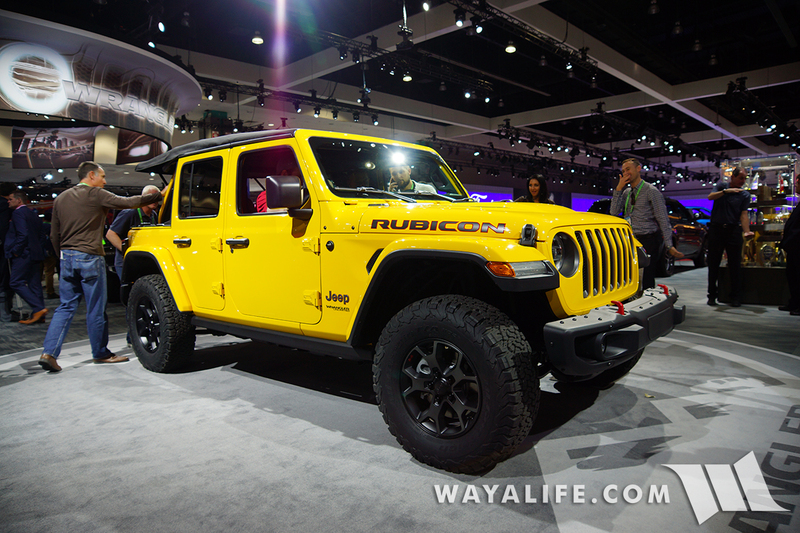 Be the first to comment on "2017 LA AUTO SHOW – Yellow Jeep JL Wrangler Rubicon Unlimited"